Teenagers, kick our butts. Tell us what the future will bring. Sometime in late February, North presented us with a list of things they wanted to do for their thirteenth birthday. Get an ear pierced and see a PG-13 movie were on the list. (They’ve only seen one, School of Rock, that we let them watch in sixth grade because they were acting in the play.) They also wanted to go out for hot pot, because about a year ago Beth, Noah, and I went without them and they’d wanted to try it ever since then. While most of the festivities will take place closer to their birthday, the date for hot pot was Saturday, two weeks before their birthday. The reason was that North was giving a TEDx talk that day, and a friend from Peter and the Starcatcher was coming to watch it and they thought it would be fun to have Cam come over afterward and then go to dinner with us. TEDx talks are locally organized events, loosely affiliated with official TED talks. This one was for young people (middle school to college-aged) from Takoma Park. North, at not quite thirteen, was the youngest speaker and the oldest was nineteen. North’s been writing, editing, and practicing this speech, with coaching at occasional Saturday meetings at the community center, since last spring. We arrived at the auditorium and took our seats. North was up first. Their topic was assumptions, different situations in which people might make false assumptions about each other and the importance of asking questions instead of assuming. Of course, gender was their central example because people generally assume boy or girl when they meet North. (The exact ratio seems to vary with their hair length. They got it cut about a week and a half ago and I recently heard someone call them “he” for the first time in a while.) As I watched North and then the other speakers, I thought about how hard public speaking can be, and how North makes it look easy. After North, there were three more speakers: a high school sophomore who spoke about immigrating from Ghana and made an argument for pro-immigration policies, a senior who advocated for more student-focused pedagogy in schools, and a college student who spoke about finding one’s purpose and succeeding in school. There was also a breakdancer and a couple of singers, one of whom sang “Can’t Help Falling in Love,” while accompanying herself on the ukulele, which is apparently a thing kids do now. 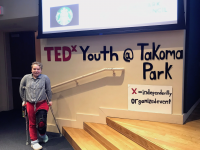 The kids’ presentations were interspersed with videos of two adults and one kid (Greta Thunberg, the Swedish girl who’s on a school strike for climate change) giving their own TED and TEDx talks. The MCs read poetry about gun violence and climate change before the talks on those topics. It was kind of a hodgepodge, but the point was to showcase what’s on the mind of Takoma youth, so it was probably a good representation of that. And hearing teenagers speak out always gives me hope. After all, it shows us what the future will bring. Shortly before the event, Representative Jamie Raskin met with the speakers and MCs backstage, a fact we might never have found out if he hadn’t tweeted a picture of himself with them because North didn’t think meeting a Congressman was worth mentioning. It can be hard to impress kids who live near D.C. sometimes. Cam had an appointment and couldn’t come straight home with us, but came over later in the afternoon and joined us for hot pot and frozen yogurt. There was a lot of giggling coming from North’s room while they were in there and the two of us them were singing Billie Eilish songs all the way to the restaurant, which is about a half hour away. 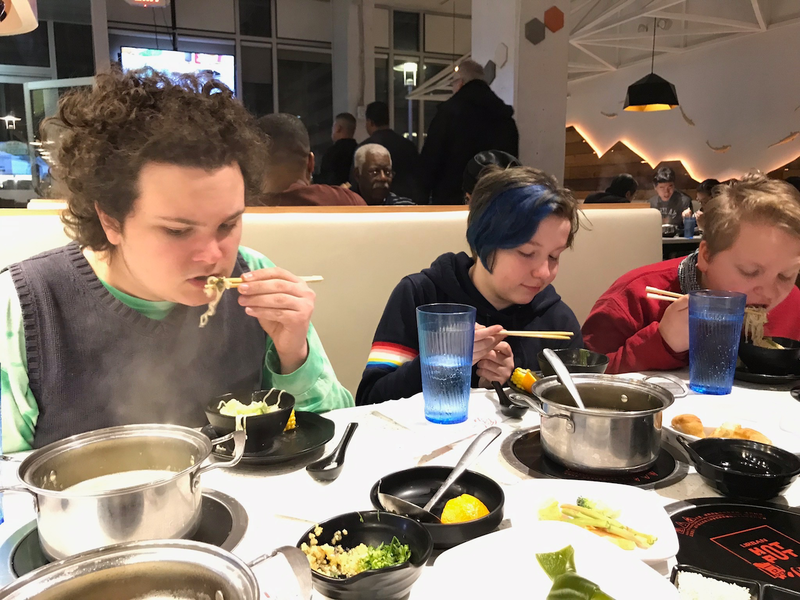 North was happy to finally experience cooking their own noodles and veggies on burners set into the tables and grabbing ingredients from the conveyor belt that runs between the tables. I managed to get my taro cooked all the way through this time and tried quail eggs, which I’ve never had before. (They taste pretty much like chicken eggs, but tiny.) It was a fun outing, but it’s just the beginning of the celebration. North is fond of birthdays and thirteen is a big one. Here’s a little advice for my almost-teen. I gave Noah the same advice, from Dar Williams’ song, on his thirteenth birthday. It still holds.